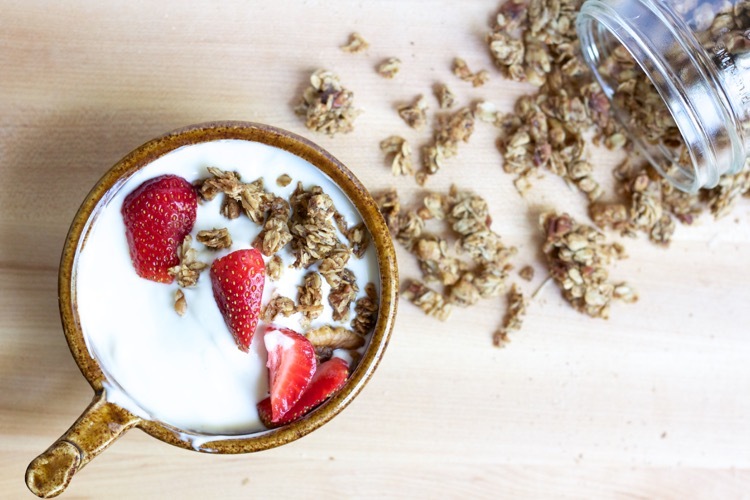 Snackable, giftable, and of course, breakfastable…I love opening my pantry and seeing a container of homemade granola inside! 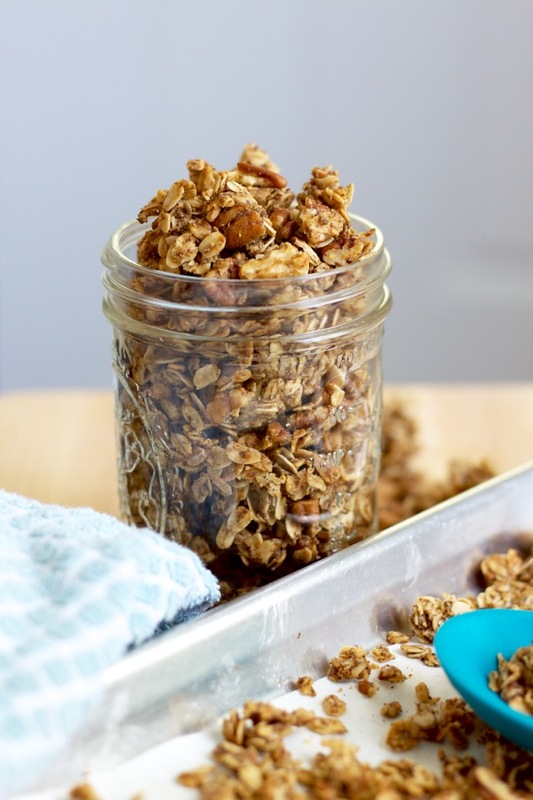 I’ve been using this granola recipe since my friend Rach first made it when we were roommates. It’s super easy to make, and you can use whatever add-ins you like. This version has a couple different kinds of nuts, and shredded coconut, since I almost always have those around! First, you mix your dry ingredients – oats and wheat germ or flaxseed, brown sugar if you’re so inclined, salt, and whatever nuts and seeds you’re using (if you add dried fruit, it goes in partway through the baking time). Then, you mix your wet ingredients – coconut oil and maple syrup and cinnamon, and a splash of water. Whenever this heavenly combination is simmering on my stovetop, I start dreaming of what else I could use it for – pancakes? Ice cream? Some kind of amazing homemade frappuccino? You mix the two together and dump it onto a pan. The hardest part is encouraging the granola to form clusters – I haven’t mastered it, but you squeeze little handfuls together and hope for the best. It’s going to be crunchy and nutty and toasty-tasting, even if it’s been unprofessionally clumped! This is pre-clumping attempts…a good time to give it a little taste! The granola bakes for 30 minutes, gets a stir, and bakes about 15 minutes more. And then you have a giant panful of this. We gave jars of granola as teacher gifts this year. I mean, it’s no cookie dough truffles (thanks for showing me up, sis), but it looks super cute packed up in a mason jar and is delicious with milk for breakfast, sprinkled on yogurt, or eaten straight out of the jar by the handful! And if you haven’t made apple pie dip yet, the combination of the two is basically apple crisp – but one snack plus one snack does not equal a treat, of course, and that is the kind of math I can do all day long. Preheat the oven to 275. Mix oats, wheat germ, brown sugar, salt, and add-ins in a large bowl (if you’re using dried fruit, it goes in partway through the baking time). Mix the syrup, oil, water, and cinnamon in a small saucepan and bring it to a simmer over low heat. Drizzle the liquid mixture over the oat mixture and stir well. Pour onto a parchment-lined baking sheet with sides (or a 9×13 baking pan). 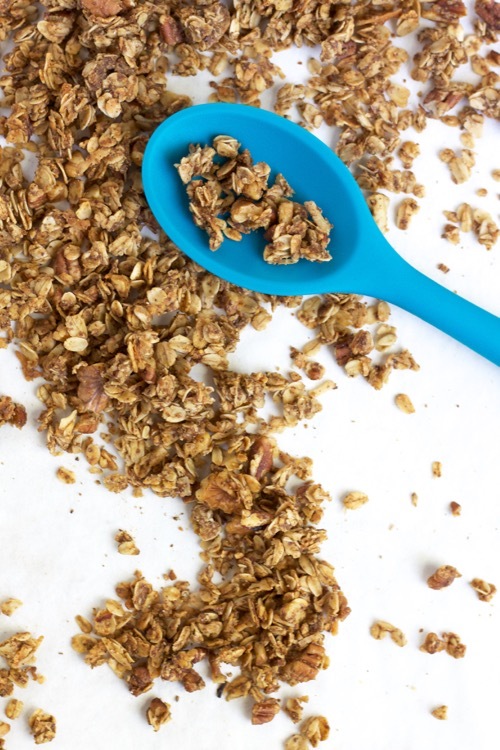 Help the granola form clusters by squeezing small handfuls into clumps, but don’t stress, because it will be perfectly imperfect! Bake for 30 minutes, rotating the pans halfway through if making a double batch. Stir gently (and add dried fruit if using) and bake for 15-20 minutes more, until toasty and golden brown. The granola will still be a bit soft when it comes out of the oven, but it will get harder and crunchier as it cools. 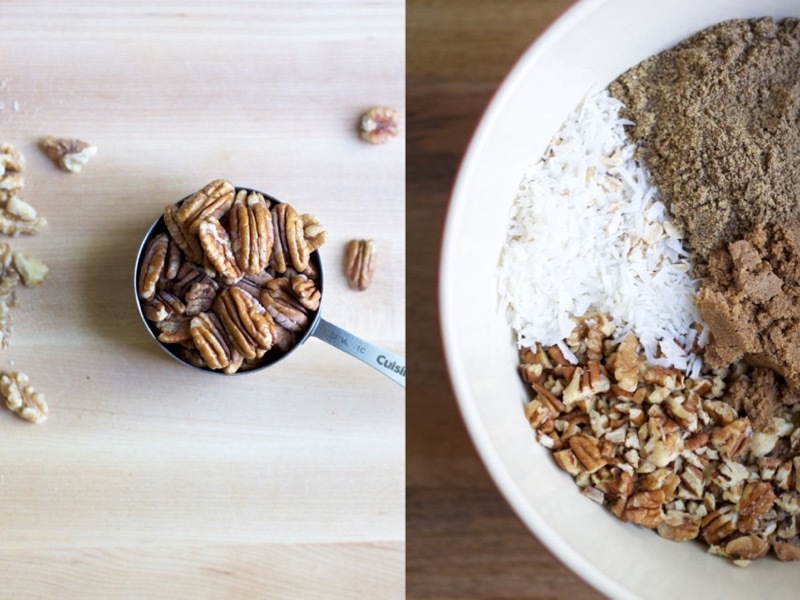 The master recipe for granola is adapted from Pam Anderson of Three Many Cooks. She has several variations, like this blueberry version. 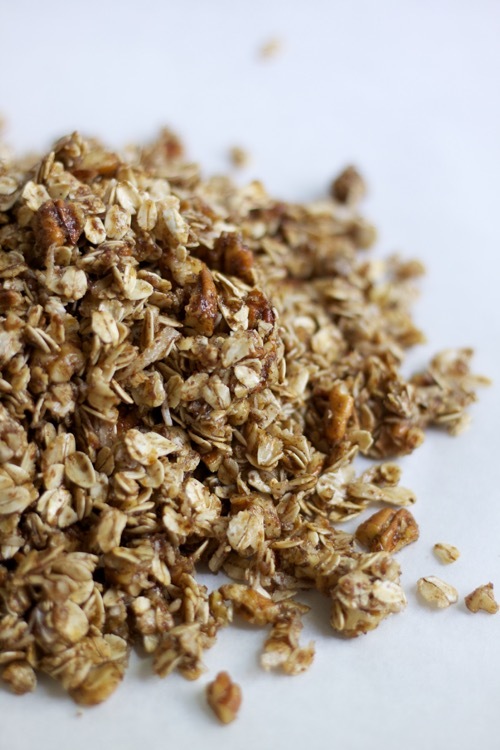 I always make a double batch…if I’m making granola, I want to have it around for awhile! The granola keeps well for a couple of weeks but never lasts that long at our house! Thanks Bet! Just wanted to note I made this yesterday, and quadrupling the recipe was perfect for 12 pint jars. And it was delicious! Man, that’s alotta granola! ;o) I’m impressed!! I love using coconut oil in the kitchen. 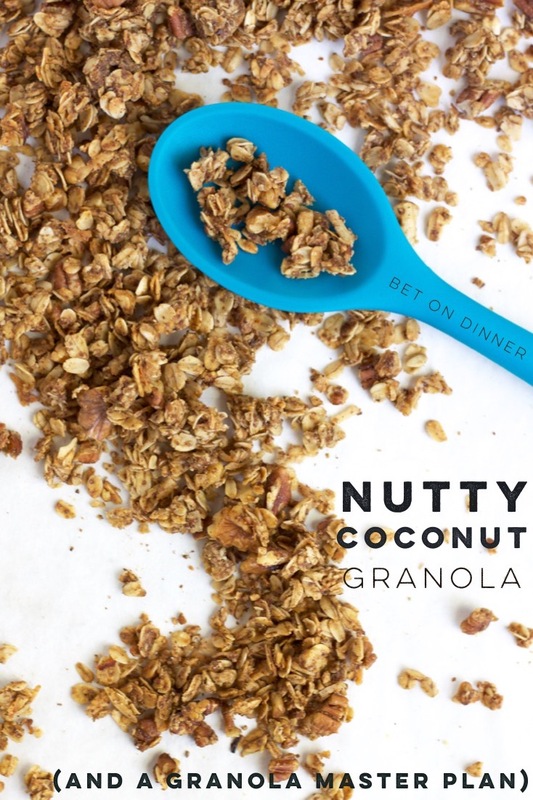 Using it in granola is a fabulous idea! YUM!